Penn Badgley, the shaggy-haired "Gossip Girl" star who's set to portray Jeff Buckley in a biopic, has taken up with the other 99 percent. The 24-year-old was seen taking photos of demonstrators in early October, and he tells CNN that he plans to revisit the protest. “I have seen it up close, I've been down there several days and I would like to continue going more," he said. "It's incredibly hopeful and peaceful. There are some problems that are simple - [such as] what do we do with this trash - and then there are some very difficult problems, like how do we go forward as a society in some truly democratic way that provides justice for all." The demonstrators, he explained, are "approaching all problems similarly, which is one step at a time, and trying to do it. It's a massive thing that not one person can accomplish. I think it's really exciting to not even be a part of that, but just these times. There's a lot of anger, I think, but there's also a lot of hope in there." Badgley's latest film, "Margin Call," actually focuses on a 24-hour period at an investment bank at the beginning of the financial crisis. "There's a moral ambiguity to the film that I think is surprisingly, maybe even deceitfully, appropriate for the movement in the sense that there is an ambiguity to the movement," the actor told CNN. However, Badgley's co-star Paul Bettany doesn't think the catalyst for Occupy Wall Street is unclear. “I think what sparked it is that in 2008 a band-aid was put over a massive gaping wound and it's still bleeding," he told CNN. "People have a sense [that] it's still bleeding. You don't need a Ph.D. to understand that you've been taking it in the seat." "Margin Call" opens October 21. Hey my 401k Fund Manager tanked my retirement fund, I expressed a desire to avoid the market when it came to backing mortgages. I wanted conservative blue chips and T-Bills. Easy right? This guy ignores my request in writing for a change in my allocations to my 401K, keeps me with the housing stuff. I don't have a retirement. So if they want to protest my Fund Manager along with others more power to them. 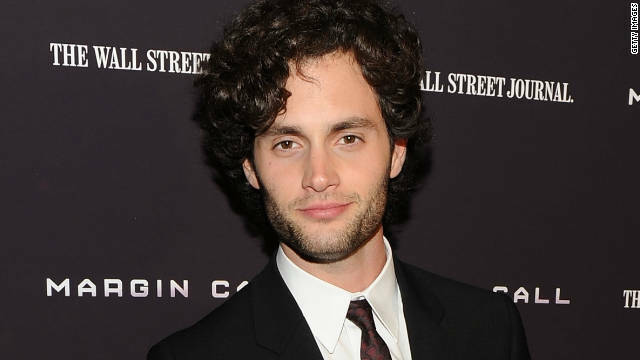 Penn Badgley talks following the Hollywood trend by wearing a few days beard. Do I fit in? I'm sure glad a bouffant-haired gay guy is supporting this mighty cause. I thought the Jonas brothers all had the last name Jonas. "The demonstrators, he explained, are approaching all problems similarly" – with drums, tweets, and witty cardboard signs.